Holy insane dedication batman! 100 people, 4 months. Stunning Full image gallery (re-posting from other blog because its awesome). Incredible. 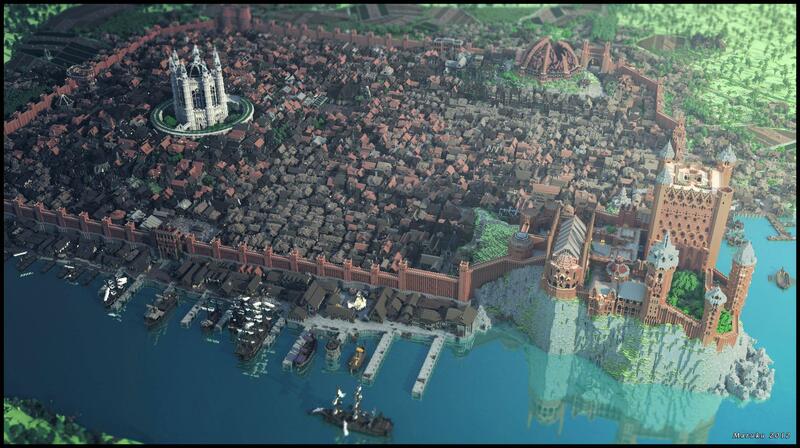 These folks win at Game of Throne Minecraft. You might need to understand what Minecraft is to appreciate the effort, or be a GoT fan to not think it is a little extreme use of time – I’m both. Impressed. Thanks to Ant for the link. Pizzainacup on Reddit – It took me and about 100 other builders a little over 4 months to build the whole thing. We estimate theres around 3000 unique buildings, all hand made and all fully decorated on the interior. The insanity level might be moderate, until I found out that they rendered the interior spaces as well. And because insanity needs a project, they’re also doing all of Westeros. This entry was posted in Books, Entertainment, TV and tagged A Song of Ice and Fire, game of thrones, George R. R. Martin, Minecraft, Reddit, Westeros, World of A Song of Ice and Fire by Typhoonandrew. Bookmark the permalink. This Minecraft project is amazing and took great dedication.